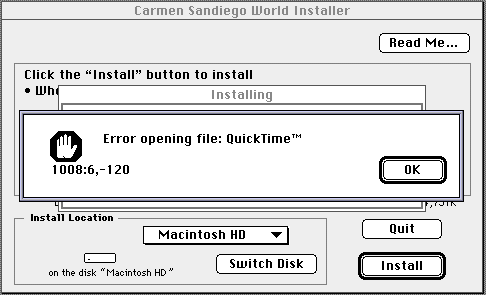 In order to play Where In The World Is Carmen Sandiego, I emulated System 7.5.3. with BasiliskII in Mac OS X, then updated to System 7.5.5. without much issue. I looked up the error code but couldn't find anything related. Do you know what I could try to install and launch the game? Which version do you attempt to run? I seem to recall the game was running fairly well in both Basilisk II and SheepShaver. It may be somewhat tricky to find the matching Quicktime the game is looking for. Do you have the possibility to try in Windows too? Some games of that time may be easier to run with Windows. I am trying to run the 3.5 version of the game. As for the QuickTime version, I don't even know how to find this information. I don't have a Win 98 emulator, I'll try to look into that. I don't understand what you're doing here. Aren't the downloads just zipped .iso files? If that's the case, what was the "QuickTime powerplug" doing in your Unix folder? In any case, as per https://en.wikipedia.org/wiki/QuickTime , the "Powerplug" is PowerPC code and won't do anything on Basilisk II. Is that the only QuickTime file you have in your extension folder? I might suggest looking for a proper copy of the QuickTime 2.5 installer. Using Get Info from the Finder ought to do the trick. I don't understand what you're doing here. I must admit that me neither! Sorry if my explanations are confusing. Thank you for suggesting QuikTime 2.5, I just successfully installed it, deleted all the game files, and installed them again. And the error no longer happened! I can only guess it's about mounting the image, topics (here, here or here) I could find here were about SheepShaver or Power PC. Do you know what I should do next? Just keep the .iso in the volumes list in the prefs editor. The CD will show up on the desktop (as it did when you installed?) and the game will find it. Good to know you got the game running. The Carmen series may not need that to run the game though. A Windows VM should be last stand only. If you ever try, do use VMWare, as there is a basic GPU emulated (DirectX 9 or better). That way games looking for a dedicated GPU will work, where the Mac counterpart (SheepShaver) fails. Gaming via VMWare running GPU demanding titles will drive you Mac´s core temps pretty high. Keep an eye on the temp sensors, just in case. I downloaded and installed it, it might be of help some day, thanks a ton!